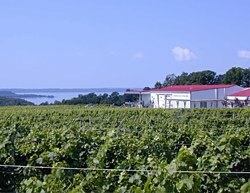 Located atop one of the most picturesque settings on Michigan’s Old Mission Peninsula sits the winery and vineyards of Chateau Grand Traverse. Founded in 1974 by Edward O’Keefe, our family owned and operated winery is the oldest and largest commercial winery and vineyard operation in northern Michigan. Success in growing European vinifera vines requires very specific conditions. The moderating effects of the deep waters of Lake Michigan’s Grand Traverse Bay are vital to our grape quality and success. This huge mass of water nearly encircles Old Mission Peninsula, thus significantly buffering the immediate surrounding air temperatures. This unique microclimate condition protects our vines during critical growing periods throughout the year and allows us to grow European vinifera vines in a climate otherwise considered unsuitable for the delicate vines. Chateau Grand Traverse focuses its emphasis on ten key European vinifera grape varieties: Riesling, Chardonnay, Gamay Noir, Merlot, Pinot Noir, Cabernet Franc, Pinot Gris, Pinot Blanc, Pinot Meunier, and Gewürztraminer. Our 100% European vinifera vineyards marked the first commercial planting of these premium grape varieties in our State. Today, Chateau Grand Traverse produces approximately 80,000 cases of wine per year.